When I get an autocomplete box for type member and scroll through the members, these get underlined. This does not occur in other autocomplete boxes, e.g. one showing types. PD> autocomplete boxes, e.g. one showing types. PD> Plz see the attachment. I am using the font 'Envy Code R VS' (which is a font that instead of bold characters displays italic characters) and have set the Resharper Completion appearance setting to display items in Text Editor font. 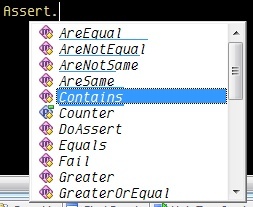 When I change this setting to VS Intellisense font indeed the underlines have disappeared. FYI, I did not have this problem in 4.1 with the same font and settings.